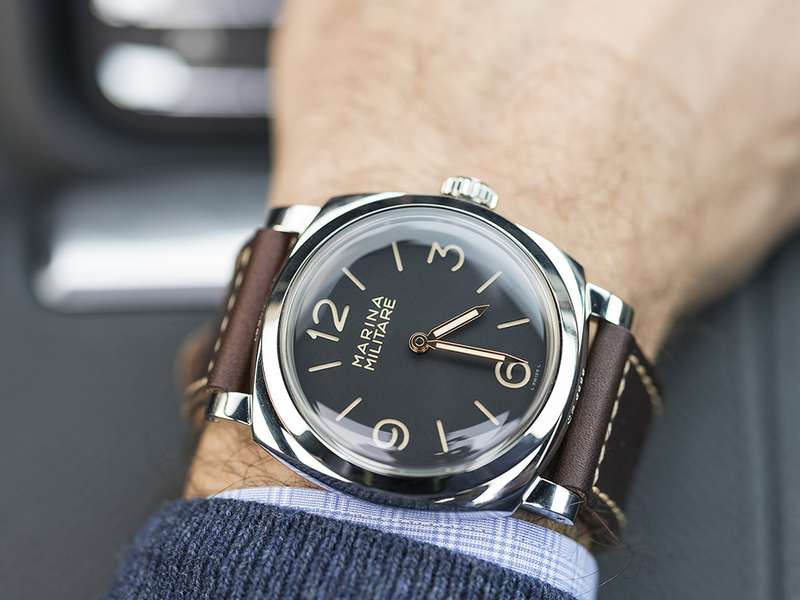 It was late 30s when the Panerai legend was born with the radium filled dials of the Radiomir models. Designed directly in military specs, pocket watch mechanisms were put in to over size watch cases in order to have efficient visibility under water. When the watches started being used by the Italian Navy, the requirement for several revisions kicked in. In order to put straps on the pocket watches the cases are soldered with wires on both sides and the straps are sewn on those wires. Unfortunately this design was not dependable for rough military use which led designers to develop thick lugs instead of thin wires. 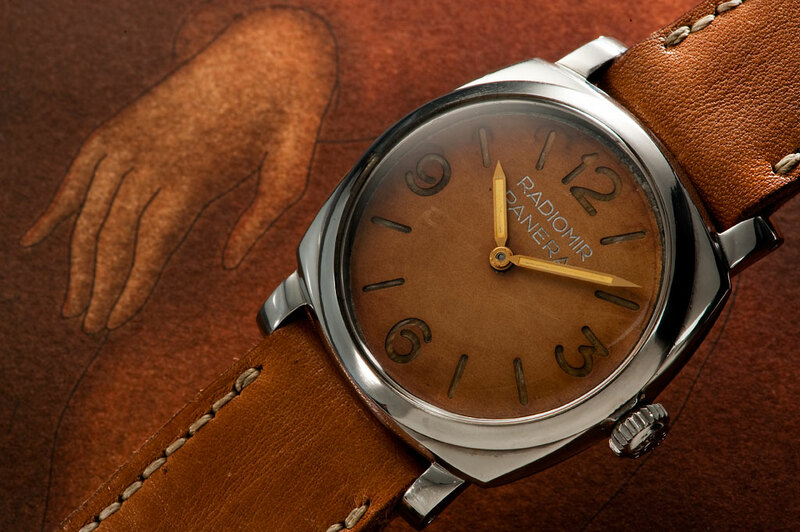 The model kept the name Radiomir as the Panerai was still using radium to fill the indexes and hands. A very few number of Radiomir 1940 models were given to Italian and Egyptian Navy before the design was refined by using tritium instead of radium and half moon shaped winding crown guard for effective winding without compromising the water resistance. Those special watches are considered to be one of the most valuable time pieces due to their rarity. 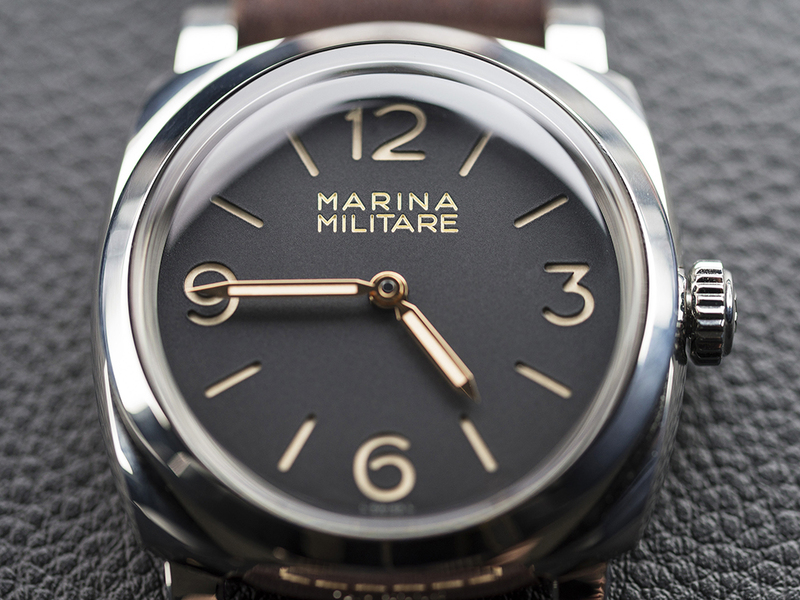 Panerai added a unique watch – PAM00587 Marina Militare to it's collection making the loyal fans of the brand amazed. Limited to 1000pcs only, the watches were sold in a flash which was an expected situation for a rare watch like PAM00587. The box set features the same details like big size wooden box, locking cover etc that we are familiar with other special edition Panerais. The set also includes a spare plexiglass crystal as well. 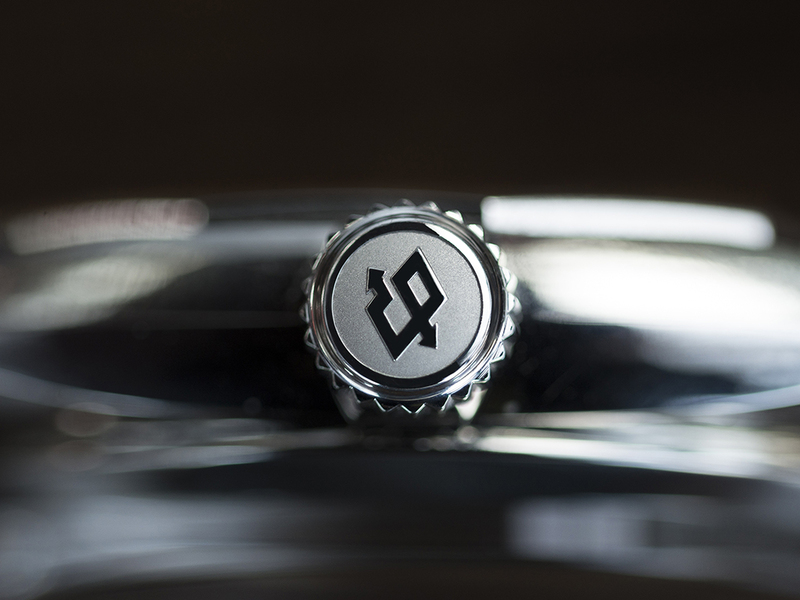 The 47mm diameter case is made of 316L grade stainless steel. All parts are mirror polished except the case back making the watch shine at every angle. Panerai is well known with it's over size watches. On the contrary, those big watches are quite comfortable to wear. The cases, thanks to their clever designs, wear very balanced even on small wrists. Let us remind you that one of Panerai's top selling markets is Far East. The crystal is made of plexiglass in order to get a matching mood with the original Radiomir 1940. The crystal is very thick. The structure of plexiglass in prone to scratches unlike sapphire but due to it's flexible manner it's quite resistant to impacts making it virtually shatter proof. The scratches can be wiped off in seconds with simple chemicals therefore this unique detail should not be considered as a deal breaker. The case back features a sapphire window. The watch is rated WR100M. Between the lugs on each sides there are reference No. and case code engraved. The indications on the case back is different from the standard versions. The dial is one of the most eye catching parts of the watch. Lacking the small second hand, the dial looks quite simple. The best part is of course the Marina Militare writing. 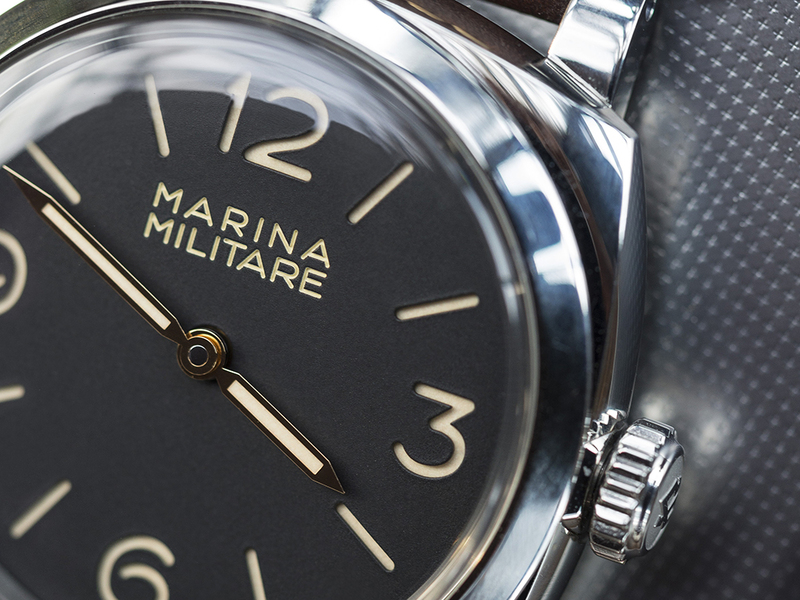 Being used in very few models, Marina Militare text is definitely adds value to the watch's beauty. The indexes and hands are filled with green color SuperLuminova which has a beige tone under direct sun light in order to boost up the retro mood of the watch. 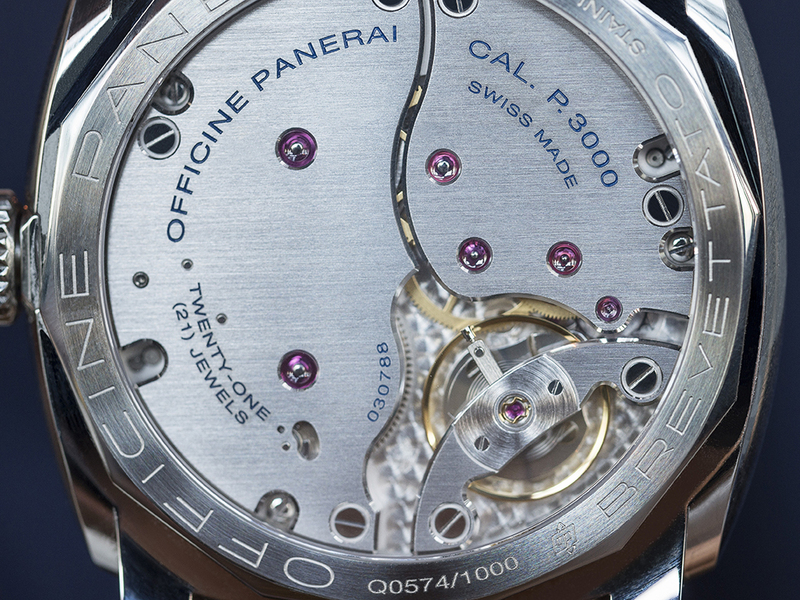 The watch features the in-house manual winding caliber Ref. P.3000. Thanks to it's double barrel winding mechanism the caliber offers 72h power reserve when fully wound. Though you may not be able to sync the watch to another source and check the accuracy due to the lack of small second function, there is a certificate of accuracy test included in the box set proving the watch works within COSC specs. There is also a Chronofiable certificate for the caliber as well. 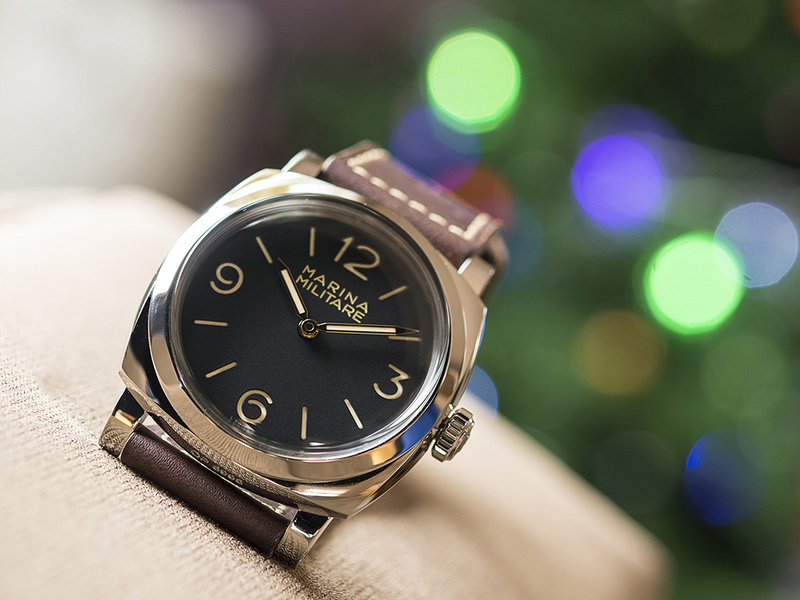 When it comes to Panerai, the most exciting part of the watch is the strap for sure. PAM00587 is being offered with an exclusive strap. We had the privilege of seeing the strap in person when we are at the special event for the design team of Panerai. Back then, nobody know about the watch that the strap will be used on. We are pretty sure that there will be lots of Panerai fans looking to wear their watches with aftermarket straps as well. 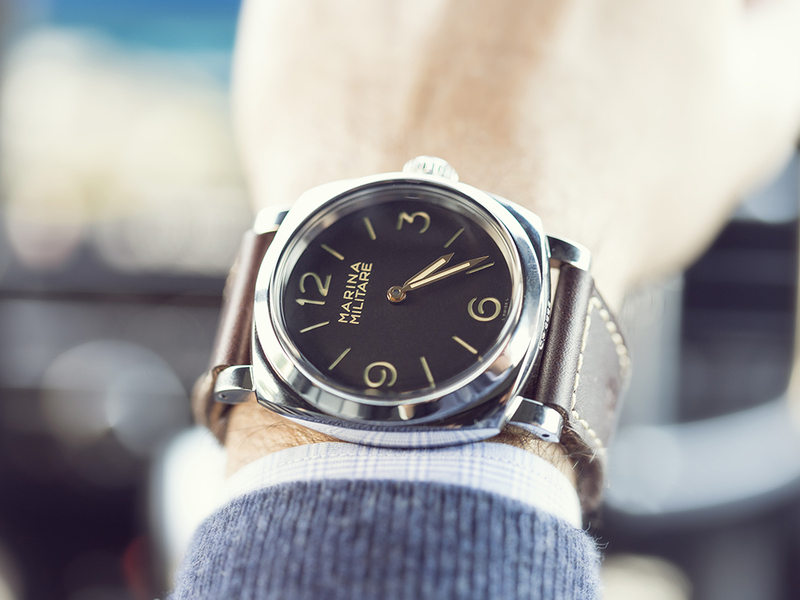 Arguably one of the most special Panerai models of recent years, we are sure that PAM00587 will always be highly praised among fellow Paneristi and other watch aficionados making the watch a classic. The MSRP of the watch was stated as 7900 EUR but due to the drastic change in CHF currency, the figure is revised to 8900 EUR. 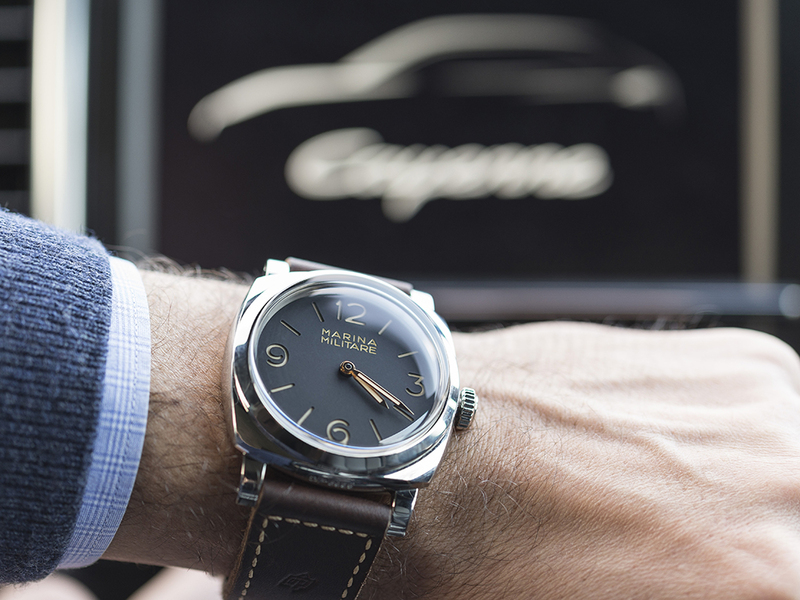 We strongly recommend this unique Panerai and suggest prompt action for shopping as the waiting list is already over production number.